“These are my babies,” says Marco Soldani as he shows off his 4-month old Chianti Sangiovese vines. Soldani is the head agronomist at Castelfalfi Resort, a 250 million euro development in Tuscany under the direction of German tourism giant Tui. Despite the golf course, 4 swimming pools, 41 apartments, 3 hotels, 1 conference centre and other facilities, some planned, some already open at Castelfalfi, this is a sustainable project. 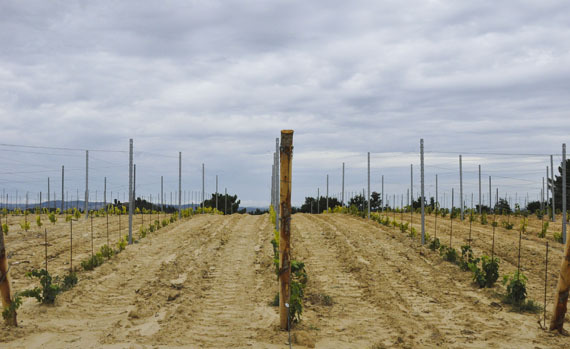 The development of local agriculture like olive oil and wine are at the heart of this sustainability, but even more so, it is the attitude with which it is done. Soldani’s strong belief in education through nature, supported by the resort’s management, is just one example of the respect for the environment that both management and staff here have. 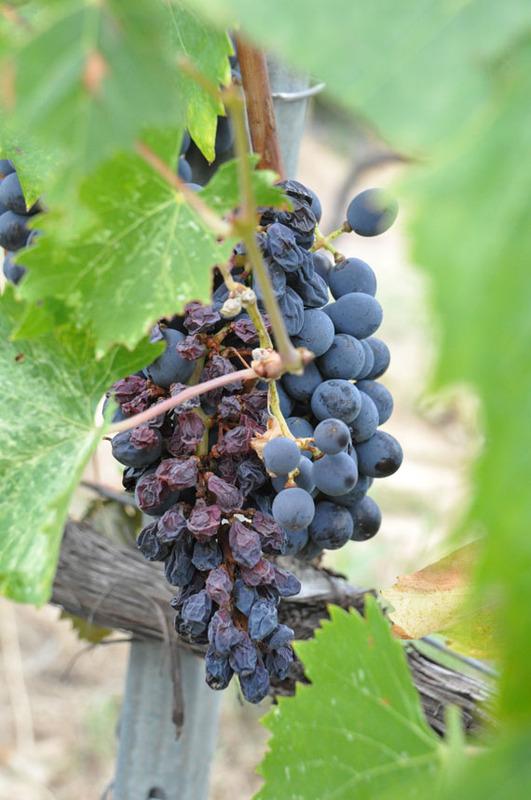 Vendemmia, or the grape harvest, is in five days’ time and Marco Soldani is getting both excited and nervous. 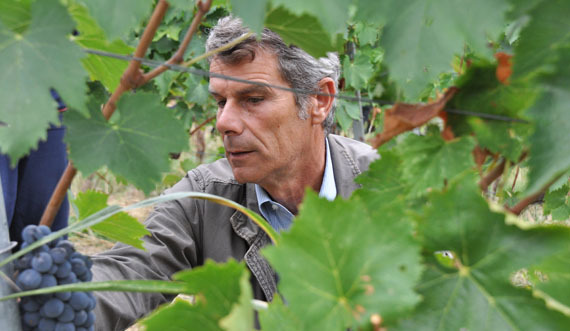 He’s in charge of 20,000 hectares of production (which may increase to 30,000), half of which are in Chianti territory and subject to that denomination’s regulations, the other half IGT red grapes of other varietals (Sangiovese, Cabernet, Merlot, Alicante, Colorino). 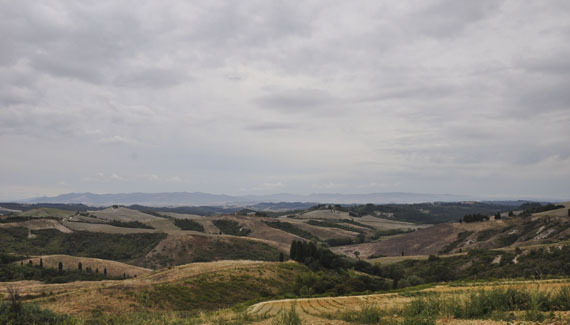 As he gestures over the vast landscape, a storm brews in from the direction of the sea – we’re no more than 45 minutes from the Pisan port – and he explains how the grapes right now, after nine months’ work, are sensitive to wetness, which can cause them to bloat, explode and shrivel up, or worse, grow mold. He shows us some examples of where this has already taken place. 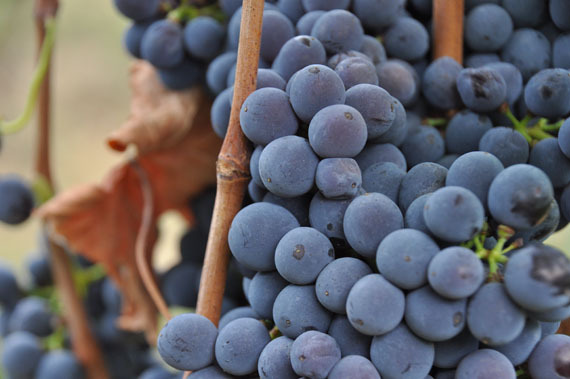 These precious grapes will be hand picked. They’re almost ready, but not quite. I take a cluster in my hand; it is firm, dense and heavy. These are some of the sweetest and best grapes here, while other, less important ones will be machine-picked (by joel). The whole crew is on standby, because a change in weather can mean having to act quickly. Soldani’s got plenty of other problems, like cinghiale (wild boar), which he tries to keep out of his fields. “They always find the best quality grapes,” he laments. The cinghiali dug up and ate 40 hectares of sunflowers overnight earlier this summer. 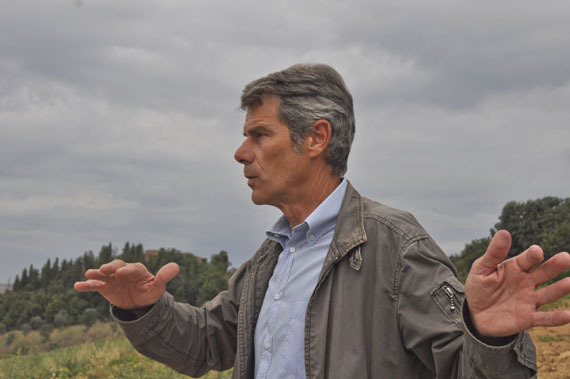 He’s doubled his efforts to protect a small, experimental production of saffron plants, a crop that is typical of the hills around San Gimignano, which is not so far from here. Lightly electrified fences seem to do little to keep out the beasts. Cinghiali are, however, part of the fun here at Castelfalfi, where it is possible to hunt under masterful guidance. The resort adheres to a strict “replacement” policy, so that anything killed is replaced with more. Which is why Soldani has more wild boar than he’d like. Over on the golf course, there are also animals. Cinghiali can do a lot of damage to any landscape, so you can imagine they are not terribly welcome in this extensive, 27-hole course, with its special grass that gets cut, in some cases, twice a day. 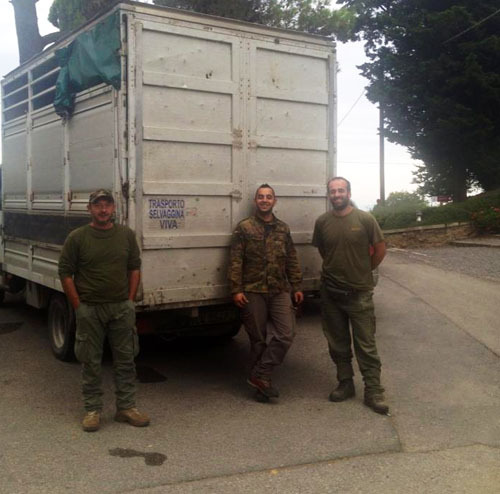 But Mirella di Marco, secretary in charge of the golf course, says that where there are animals it’s proof that they limit chemical treatments and care for the environment. In fact, the golf course is full of birds, and the ponds encircled by rushes make great homes for ducks. Mirella is also a testimonial for how the development of Castelfalfi has brought new life to an area that had, sadly, been abandoned some years ago. Tenuta di Castelfalfi was a farm with a small borgo, and its 60 or so inhabitants were farm hands or otherwise employed by this industry. In the tradition of mezzadria, the landowners and workers divided the proceeds of the land half and half. But over a decade ago, the owner sent everyone away; the farm was no longer economically viable. So the inhabitants of Castelfalfi moved. Some to the nearest town, San Vivaldo, others further afield, towards Pisa or Castelfiorentino. 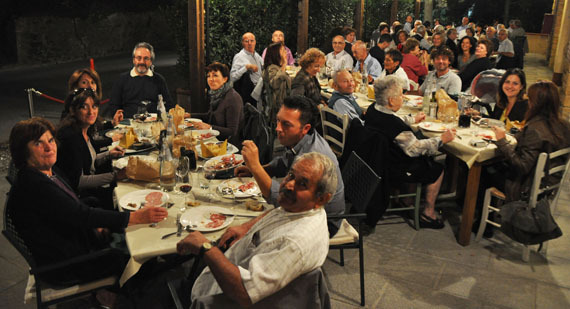 Many are in their 80s, and I witnessed their first reunion at the restaurant Il Rosmarino, part of the Castelfalfi complex, the other night. Mirella, who now works full time at the golf course, grew up on a nearby farm, and became interested in golf when she met the then-architect of the golf course that was previously on this property. He instilled in her an appreciation of the course for its landscape architecture and natural beauty, which she illustrates with pride. She had to leave this zone of Tuscany for a decade, but thanks to Castelfalfi, she is now back home. And she is one of many local employees who are benefiting from this development. 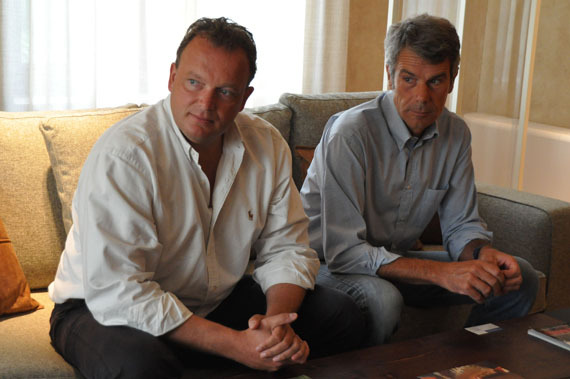 Stefan Neuhaus, CEO of Castelfalfi and one of Tui’s most trusted top managers, lives on site in order to oversee every element of the massive development as well as daily running of the 3-star hotel, La Tabaccaia, the golf resort and the property sales. Despite this time of economic hardship, he affirms “Tuscany has consistently remained a good investment,” and he is confident that this project will be a huge success. Alongside the immediate employment of local staff, the restored borgo’s stores provide an income possibility for local shopkeepers: shops can only be owned by those who already have a shop in the comune of Montaione, since the resort is closed during the winter. Another interesting element is the attention to sustainability that is unusual here in Italy: the resort has its own energy production (with biomass) and water supply (with a dam). Oh, and all the buildings are restoration projects, without increasing the volume of extant space. 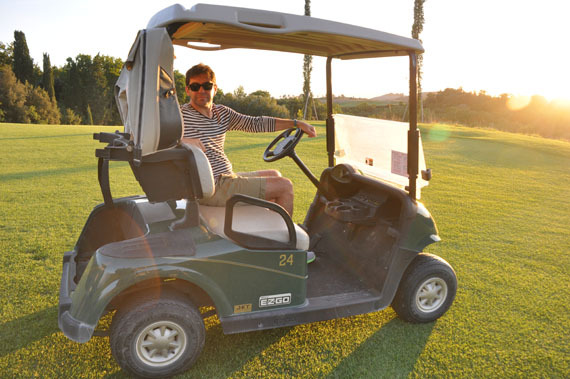 Now for the customer experience: is it FUN at Castelfalfi? I’d say yes. 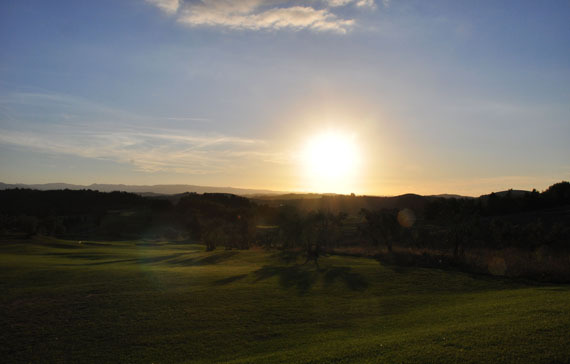 This is a place to come and relax, to eat good food, to learn about how wine grows, and to play golf (if you can – the course is considered the most challenging in Italy). With the opening of a convention center and further accommodations in the coming years (the projected end date is 2018 and building is on schedule), there will be always more to do on the property. It’s also not far from Florence (we were home in 1h15), and close to Pisa, Siena, Volterra, Certaldo (home of Boccaccio) etc. It’s not where I’d suggest you set up a home base for a week of exploring, but more ideal for a relaxing stay absorbing the countryside. The first hotel to open is the 3-star Tabaccaia, in a restored cigar factory. The décor is modern but warm, eschewing typical Tuscan (thank god – I’ve had too much of that) for a more international look. Italian architects have done a good job choosing stylish accessories and excellent quality fixtures for the hotel, which looks and feels like a 4-star, but without the free spa slippers, and priced reasonably (a standard double room’s maximum rate is 130 euros per night). 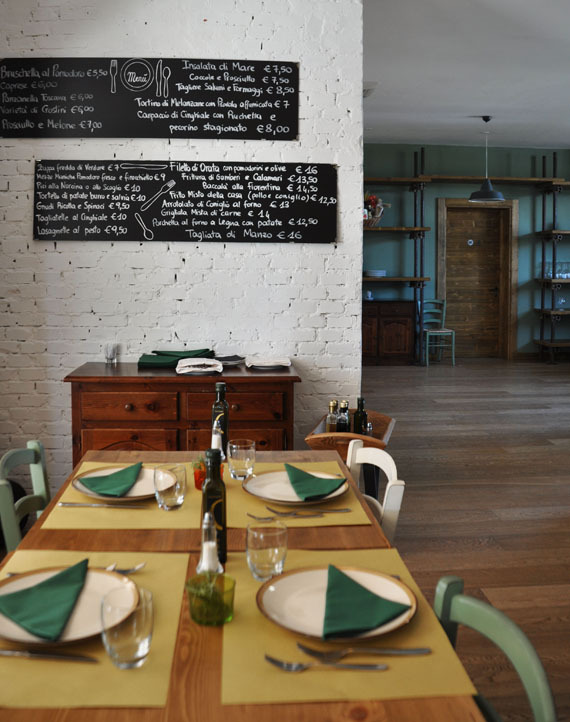 The trattoria Il Rosmarino next door serves pizza and a “revisited” Tuscan menu, again adjusted to meet the international tastes of Castelfalfi’s clients, who for now are mostly Germans. Prices range from the 5 euro margherita to the 16 euro fish or tagliata (beef). 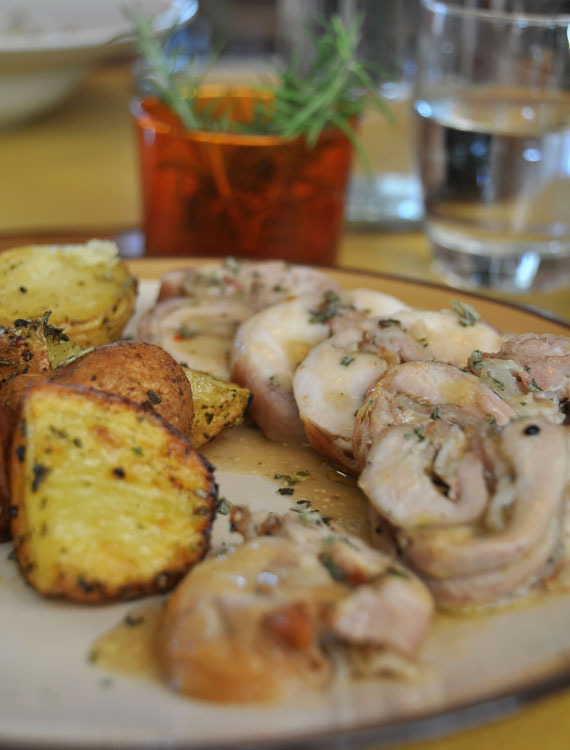 Flavours are excellent, enhanced by the locally produced oil and wine. 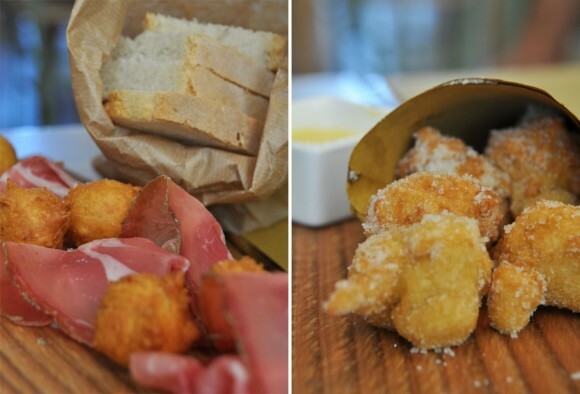 Try the chickpea flour fritters either salty, to start, or sweet to finish off your meal. The extensive swimming pool area and sauna/gym is a nice place to relax, and is open to the public with daily rates (around 25 euros per adult on weekends, less during the week and for kids). Castelfalfi is a place to keep an eye on: it hopes to become a case-study for development not only for Tui but for Italy. It’s already in the limelight of international press, and many Italian film stars have been visiting. 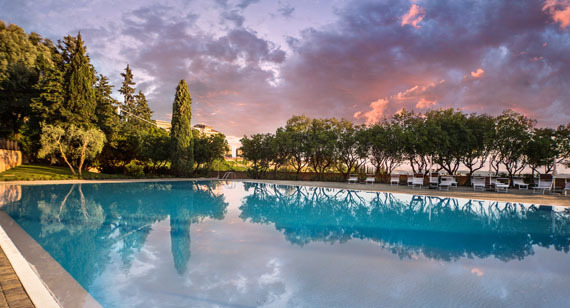 I look forward to checking out the five-star hotel when it opens, but am pleased to note that the range of hotel levels means that the beauty and peace of this newly revitalized borgo in Tuscany will remain accessible to middle-price-range travelers. With thanks to Cecilia Sandroni, PR manager, for hosting me at Castelfalfi. All opinions expressed in this article and my final judgement of the resort is entirely mine.